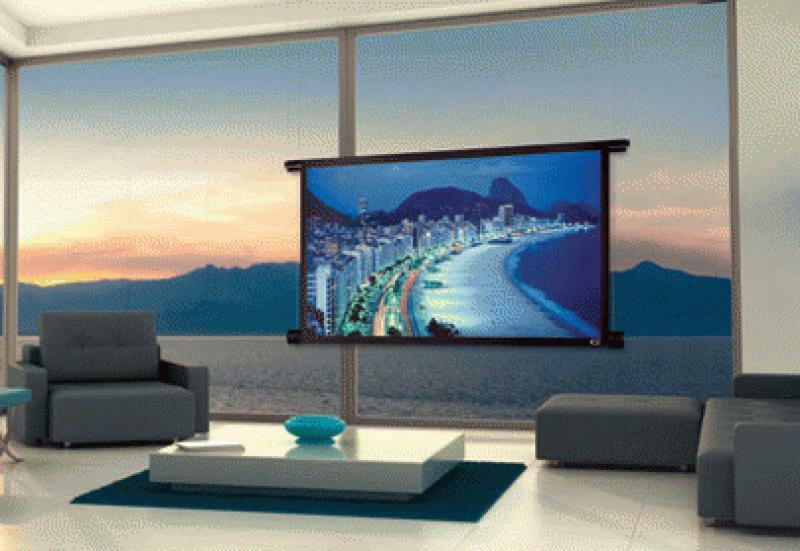 Screen Innovations (SI) recently announced that the Black Diamond Motorized projection screen is now shipping to integrators and end users worldwide. Featuring a brand new and unique motorized design utilizing SI's Black Diamond ambient light rejection screen technology, Black Diamond Motorized is a sleek flat panel alternative that disappears when not in use, making it ideal for many environments or applications. Utilizing one motor, four custom helixes, and a spool of slender aircraft cable, Black Diamond Motorized silently lowers a thin wing containing the rolled Black Diamond screen downward from a recessed ceiling-mounted cassette. The cable-hung wing then stops, and from it, a small tube quickly emerges and lowers itself down to an adjustable, pre-determined image height, leaving only the image space in sight. Because Black Diamond screens do not require masking or any black drop material, there is no visible material above, below, or on either side of the screen surface, allowing the images projected on Black Diamond Motorized to appear as though they are suspended in air. Unlike flat panel TVs, Black Diamond Motorized delivers zero glare and reflection when used in a bright environment, and by virtue of its Black Diamond ambient light rejection screen technology, light scatter is measurably reduced by over 75%. Black Diamond Motorized from Screen Innovations on Vimeo. Those interested in learning more can visit www.screeninnovations.com or call (512) 832-6939.